Anderson is ABC's director of maintenance in British Columbia. He says his goal of self-sufficiency is one reason ABC has been growing its fleet of Sennebogen material handlers over the past 10 years. His sales representative, Logan Strohm, at Great West Equipment, is sympathetic to the cause. "We have 11 service branches here in B.C., but that still leaves our techs with a lot of territory to cover," admits Strohm. "That's why we recommend that customers take advantage of the free factory training that Sennebogen offers." With eight recycling yards in B.C. and one in Alberta, ABC Recycling has been operating in the region since 1912. A service crew in Burnaby supports Sennebogen machines there and in nearby Surrey. 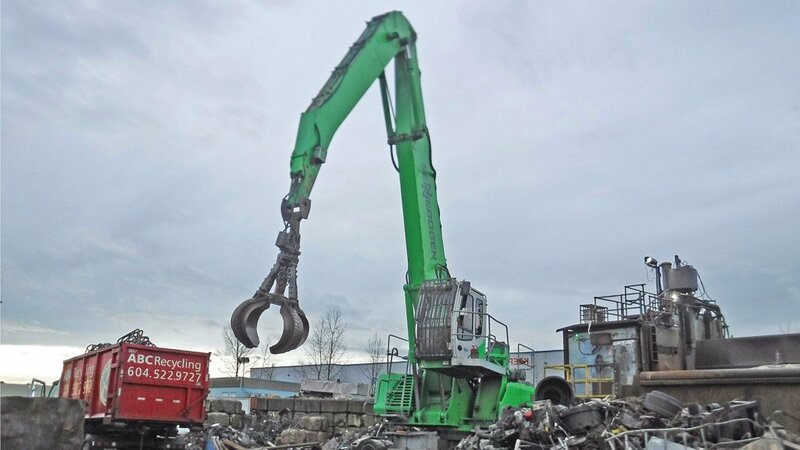 The fleet includes Sennebogen 835 M and 830 M models, equipped with both grapples and magnets. "We've had very good success with these machines," Anderson reports. "The 835 seems to be the right machine for everything we do - whether feeding stationary shears and balers, or loading trucks and rail cars." Anderson's maintenance staff and several operators have attended the Sennebogen Training Center in Stanley North Carolina. Part of a 100,000-square-foot head office complex, the Training Center provides classroom instruction as well as hands-on training with a demonstration module and full-size machines in a three-storey-high indoor bay. The Level I course and the Level II advanced program for technicians are five-day programs offered free to dealers and their customers. "It's a very impressive facility," says Anderson. "And while you're there, you also get to see the extent of their parts inventory. As well as regular and routine service items, they have a huge inventory of major components on hand such as pumps, engines, cylinders, axles and even boom and stick assemblies. You can see the company has invested heavily in parts for North America." ABC technicians and operators also now take an active role in ABC's purchase process for new equipment. According to Anderson, their maintenance team appreciates how Sennebogen has simplified access to routine service points. The layout of maintenance components includes most service and diagnostic items accessible from ground level, hydraulic diagnostic ports are easy to reach, and electrical fuses and relays are all arranged together in the main panel, accessed on one side of the machine from ground level. Auto-lubrication is also standard equipment on Sennebogen machines, which further simplifies maintenance tasks and extends the life of major components. Anderson certainly listens to his operators' recommendations. "They are in the machine eight hours a day. We want to be sure they have a comfortable operating environment along with good functionality. They like the Sennebogen Maxcab for its visibility and its two-camera system. They tell us the seating is comfortable and the machine is easy to handle." Parts availability is also a significant factor that has attracted ABC to Sennebogen machines over the last decade. Anderson notes that, where many machines are designed with proprietary components, Sennebogen uses commonly available parts wherever possible for power, hydraulics, electrical and other service requirements. This approach advances Anderson's goal of self-sufficiency. "We can get all the parts we need from our dealer, of course, but we can also source parts locally. With their Cummins engines, we can find routine parts almost anywhere. Some parts might be a challenge for us to bring across the US border, but our dealers (Great West in B.C. and Strongco in Alberta) are able to help with expediting that too." In the long run, the simplicity and serviceability of their Sennebogen machines are expected to lead to a lower life cycle cost for ABC.